So I put it in the freezer for about 15 minutes or so, and then took it out. This yogurt was separated into two parts- one of just yogurt, and another of a liquid-like fruity side. I took a scoop of the yogurt and was amazed how THICK it was. looks just like ice cream! I tried the greek yogurt part first- it was plain, but not too tart, which I liked. It was soooo thick, almost like a paste! The fruit part was de-lic-ious. The perfect balance of cherry and pomegranate flavors, it was sweet and slightly tart. There were also actual shreds of pieces of fruit in there! And of course, when eaten together? A creamy treat, that knd of reminded me of what a cherry pie would taste like in yogurt form. MMM! 1 container is 120 calories, 0 grams of fat, 19 grams of carbohydrates, 0 grams of fiber, 16 grams of sugar and 11 grams of protein. I love YOGURT! I try to eat at least one every day, whether it’s for breakfast, snack, or even dessert! 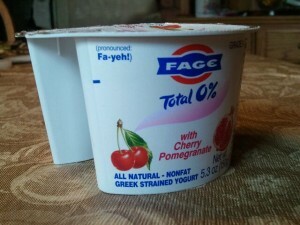 A yogurt I have seen in the stores by me is Fage, which according to the website, makes “Ridiculously thick yogurt”. 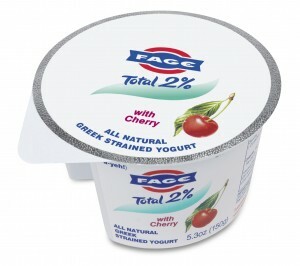 They have a few different types of products, including the TOTAL 2% Peach, Strawberry and Cherry yogurt. 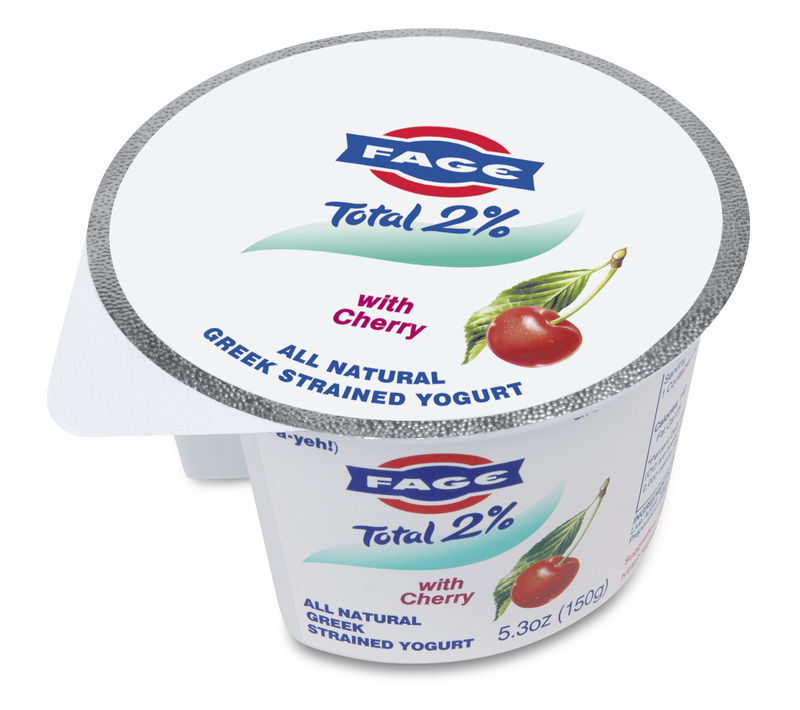 The people over at Fage sent me some coupons to try out some of their products, and I was most excited about the TOTAL 2% yogurt with the fruit compartments. I decided to try the Cherry, Peach, and Strawberry flavors that were offered. The TOTAL 2% yogurts have 2 compartments, one with yogurt, and the other, smaller, compartment has an almost jelly-like flavor. It’s sort of like a fruit on the bottom yogurt, but the fruit is actually separated on the side. I thought they looked cool and interesting, so I figured why not give these a try? The yogurt part on all three flavors was pretty much the same. 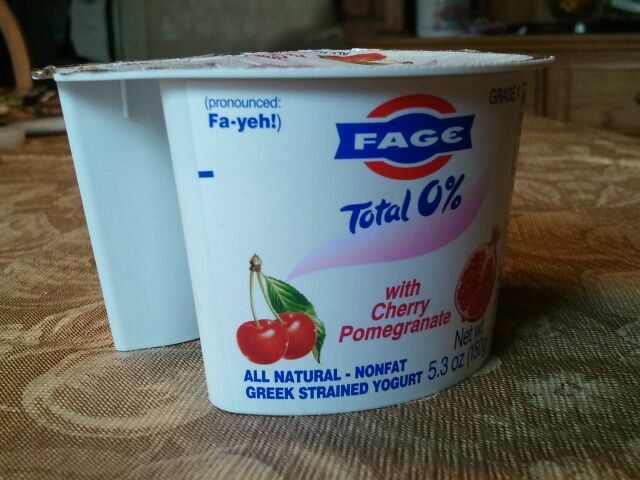 A plain, tart but not too tart yogurt, that really was quite thick. It was creamy too, and sort of reminded me of sour cream. I also think it had a bit of actual cream taste, which was really delicious. I enjoyed this part plain, but also with the peach, cherry and strawberry sides. 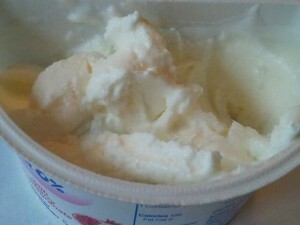 1 yogurt is 130 calories, 2.5 grams of fat, 18 carbohydrates, 17 grams of sugar,0 grams of fiber and 11 grams of protein.